I feckin love this tune by joe-dolce. 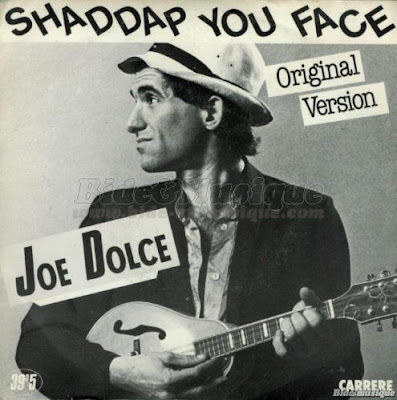 In July 1980 he recorded the self-penned "Shaddap You Face" for Full Moon Records label at Mike Brady's new studios inWest Melbourne. When in Ohio, Dolce would sometimes visit his Italian grandparents—they supplied the inspiration with "What's the matter, you?" and "Eh, shaddap". He wrote the song about Italians living in Australia and first performed it at Marijuana House, Brunswick Street, Fitzroy in 1979. Dolce paid AUD $500 for the recording and spent $1000 on the music video clip, which was created by Melbourne filmmaker, Chris Lofven. It became a multi-million-selling hit, peaking at No. 1 on the Australian Kent Music Report Singles Chart for eight weeks from November 1980, in UK from February 1981 for three weeks, also No. 1 in Austria, New Zealand and Switzerland. Dolce received the Advance Australia Award in 1981.